On November 24th, actress Horikita Maki attended a commemorative event for NTT Docomo�fs new product, �gXi Smartphone�g. At the event, Horikita celebrated the release with a ribbon cutting ceremony along with NTT Docomo�fs president and representative director Yamada Ryuji. This bridal event was 2 years ago but haven't seen the pics before, Maki is looking real . Had posted this in the Meisa thread, but I guess I'll post it here as well. ^^ I've seen quite a few pics with both of them together, should grab and post them unless you have them and want to do it. Know they did a short movie a few years ago, have they done anything else together then? They are from the same agency and apparently good friends off-screen. They both co-starred in Chance! and they also have been in other shows together. Maki yesterday at an advance screening for the movie �gAlways San-Chome no Yuhi �e64�� (�gAlways: Sunset on Third Street 3�g) that's coming out on Jan. 21st. PS- Koyuki in the first pic is 9 months pregnant. New Maki CM for NTT docomo. Couple new Maki CMs for Fuji film. Shots of Maki on the set of Umechan Sensei which is starting up on April 2nd. Maki lookin' real good in the 1/7 issue of Weekly Shonen, good way to start the year off. I everybody !! I'm new in this forum and I've got a question is there subtitles for the movies Byakuyako (2011) ? thanks ! Maki from Story Box, would post more of it but this site for some reason has a problem with thumbnails. Promo event 2 days ago for Disney/docomo. From the ALWAYS San-chome no Yuhi �e64 film premiere. ^^ Sorry, haven't seen it but sounds interesting, if found will post the fact here. One pager from the Feb. issue of Mina. NHK updated the page for Maki's new daytime drama starting up in April, Umechan Sensei. Maki lookin's super at another �gALWAYS San-chome no Yuhi �e64�h premiere last weekend. It was announced that Horikita Maki will star in a new movie �gMugiko-san to�h as an anime Otaku girl named �gMugiko�h. Horikita�fs co-stars include Matsuda Ryuhei as Horikita�fs older brother, Yo Kimiko as Horikita�fs mother, and other various cast members, such as Aso Yumi. �gMugiko-san to�h is Yoshida Keisuke�fs new movie with the theme of �glove between a parent and child�h, and it is said that Yoshida spent 7 years on its plot. After their father passes away, Mugiko (Horikita) lives with her brother (Matsuda) in a city. One day, their mother �gAyako�h (Yo), who left them when they were little and haven�ft heard from her since, comes back to them, but before long, the mother who was hiding her illness, passes away. 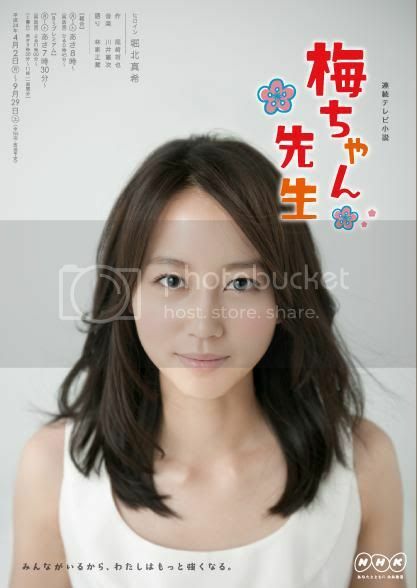 Mugiko visits mother�fs hometown to lay her ashes to rest, and she finds out her mother was like an idol of the town. As Mugiko looks exactly like her mother, the whole town suddenly begins to liven up, and it also causes confusion. At first Mugiko feels antipathy toward her mother, but by coming in touch with more of her mother through the people at the town, a new and different feeling starts growing in Mugiko. Horikita�fs role, Mugiko, is an anime Otaku girl who has a dream to be a voice actress and works at an anime specialty store. Reportedly, there will be a scene where Mugiko mimics a character �gMegu-chan�h from �gIma Doki Doukyuusei�h, which is supposed to be a popular anime in the movie. �gMugiko-san to�h is set for release this fall. I love ALWAYS -- one of my top Japanese movies. I am now rewatching HanaKimi, just melts away stress I don't care what some people say about Maki-chan's acting there. It's funny and I love it! For sale on September 26th! If you make the purchase please email [email protected] so i can see how many fans are supporting! Maki Horikita to appear in one episode of "Oyaji no Senaka"
Horikita Maki will be playing a policewoman for the first time in one of the episodes of TBS summer 2014 drama "Oyaji no Senaka" (A Father's Back) which is due to begin its run from 13 July at 9pm on Sundays. The drama will be episodic in nature with one scriptwriter responsible for each episode featuring a different lead actor or actress. Horikita will appear in one of the episodes written by Izumi Tsutomu and his wife Mega Tokiko (O.A. date not confirmed) where she plays a policewoman who gets told by her male childhood friend who is also a police officer that he wishes to stop being friends with her. Upon hearing this, her angry father played by Endo Kenichi will step in to help resolve the situation although he ends up being more of a hindrance. 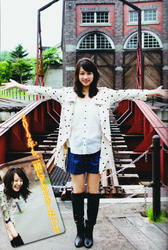 Horikita last appeared in Izumi and Mega's work "Nobuta wo Produce" 9 years ago which became her first shot to fame. Filming begins in the beginning of July.